Custom Photo Mousepad For Dad Only $2! You are here: Home / Great Deals / Custom Photo Mousepad For Dad Only $2! Looking for a unique and functional gift for Dad for Father’s Day? 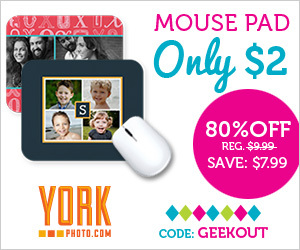 Look no further than this awesome deal for a Custom Photo Mousepad For Dad Only $2 at York Photo! Simply upload your favorite family pictures, company logo or even Dad’s favorite characters to create a unique and useful gift he is sure to love! Grab this and other fun photo gifts at York Photo every day!